Bees are responsible for forty percent of the food we eat. 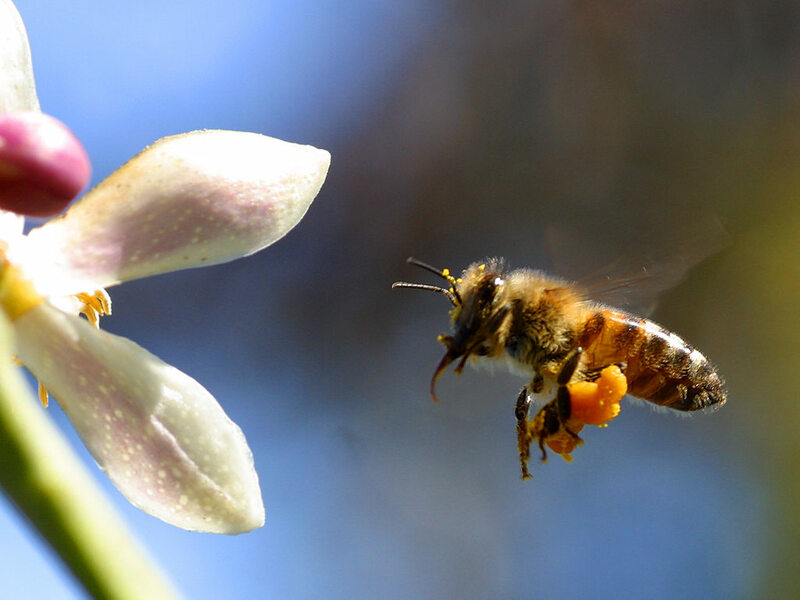 Without bees, we could find ourselves facing food shortages and a collapse of the green and flowered world. Listen to this hour of "To the Best of Our Knowledge", a peek inside the world of bees, from the once-in-a-lifetime mating flight of the queen bee to the California almond agri-business, where most of the bees in North America go to work. And, the poetry of bees. Listen to Erin Clune on Urban Beekeeping. Erin Clune is a reporter for Wisconsin Pubilc Radio and a blogger. She visits the hives of urban beekeeper Bob Falk from Madison, Wisconsin. Neonicotinoid pesticides like clothianidin may be killing our honey bees off by the billions, destroying a key species and endangering our food supply in the process. European countries, including France, Italy, Germany (the home country of clothianidin manufacturer, Bayer CropScience) and Slovenia have begun banning these poisons, and some bee populations are beginning to recover. The scientific study (by Bayer, the manufacturer of said pesticide) used to justify the approval of clothianidin in 2010 was found lacking by our own EPA scientists but the EPA wants to wait until 2018 to review the safety of this suspiciously approved pesticide. One thing you can do to take action is to urge the EPA to immediately ban the use of neonicotinoid pesticides and insecticide-producing genetically engineered crops until and unless new independent scientific studies can prove they are truly safe. Fall out from the aerial spraying in Dallas. Dead wild bees on a porch…victim's of the aerial spraying. Planting drought tolerant bee, butterfly and hummingbird habitat this Fall will help to support dwindling bee populations.